What a couple of weeks it has been. Firstly, I'm struck down with a horrendous tummy bug, then as I'm recovering, it hits my little one! Mixing tummy bug with teething makes for one very clingy little lady, who only wants mummy, nothing else and nobody else will do. Is there any wonder I've been unable to craft or blog for a while? And what have I learned from this? Plan ahead, weeks and weeks ahead! But enough of my life, and lets get back to the wonderful world of crafting! What do I have in store for you today? Why there is a new Reward Code, and, new Weekly Deals too. What is a Reward Code I hear you ask? A reward code is a lovely little alpha-numeric code that I give out each month, and when you use it on your Stampin' Up! order, you get rewarded with Stampin' Up! goodies after your order! 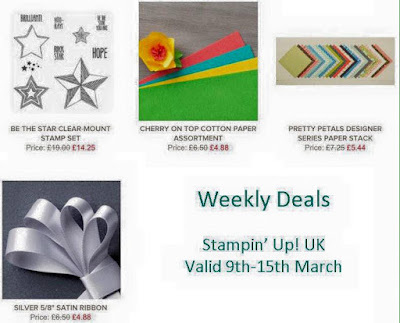 Last month's customers that used the Reward Code received an assortment of Stampin' Up! goodies, including Multipurpose Adhesive, Stampin' Pad, and much more (including a thank you card and gift that I sent to all of my customers, regardless of whether they used the Reward Code or not). What about this week's Weekly Deals then? I adore the Pretty Petals DSP Stack, and at just £5.44, I don't expect it to still be available at the end of the week. Don't miss out, get yours before they sell out! I'm now off to my craft desk, to get some of the creations that are currently bouncing around my head out, and into paper form. I hope you come back soon to see what they are!